That cute plastic church key... We've got'em! Plus, you get a long lasting dark purple ribbon. Plastic, looks like a church key. Always in stock. 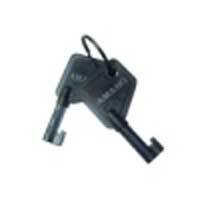 Be sure you are ordering a key that fits an old style “church key“ hole. Tell us what model you have on the checkout page, in the Comments section. We will substitute the correct key if you make a mistake, and call you if we have any doubt. Ribbons, repairs, and time cards, too!